The Portugese thwarted early French designs to establish trade interests in India and the East. In 1664, Jean-Baptiste Colbert, the French Minister of Finance succeeded in establishing the first viable French Company (the French East India Company) during the reign of Louis XIV. The company established its factory at Surat in Western India and acquired a foothold in Southern India by acquiring Pondicherry in 1674. The disintegration of the Mughal Empire and the rivalry of local powers that strove to fill the vacuum, provided fertile ground for the English and the French to precipitate the Anglo-French struggle in India. As a result, the French lost most of their territories. The French territories were transferred to the Indian Union. De facto transfer of Pondicherry took place on 1st November, 1954 and de jure transfer on 28th May, 1956. 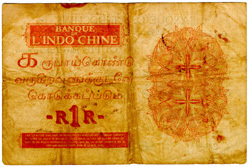 Banque De l'Indochine issued paper money for the French in India, under decrees, which find mention on the notes. 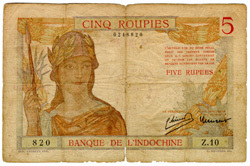 The earliest 'Roupie' denominated notes were issued in 1898. The Roupie consisted of 8 Fanons and one Fanon was equivalent to two annas. 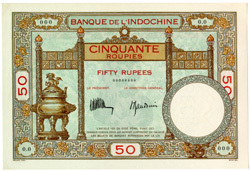 These were in the denomination of 50 and 10. 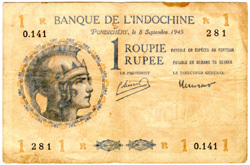 Notes of One Roupie were issued immediately after the First World War. 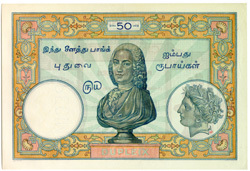 New notes of 50 Roupies carried the bust of Dupleix, who founded the French Empire in India. 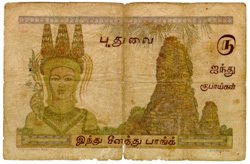 These notes continued to be in circulation till they were replaced by Indian currency in 1954.